This exhibition of the latest woodworking equipment, demonstrations and stacks of timber is one of the must-see events if you are a woodworker – whether hobbyist or semi professional. As you arrive, there are demonstrations of the Lucas saw mill, and the Swedex Logosol mini saw mill. This latter made short work of a large log using a chainsaw mounted in a frame that holds the saw horizontal for cutting slabs. The whole thing is adjustable for slab thickness and slope of the log. Very impressive for such a small mill. Once inside I went in search of lumber – I have in mind to make a couple of musical instruments – another pochette fiddle and a travel mandolin. Trend Timbers was my first and primary stop as they had some lovely birdseye maple and rosewood. I also found blackwood, silkwood and purpleheart. But alas no spruce. It seems I have to go to Sydney for that, or order it on the internet. I also got the last piece of American sycamore in captivity in Canberra. The guys there were very friendly and helpful – they even helped me carry my acquisitions to the parcel pick-up place. And I learned that Brazil is the only country to be named after a timber! Brazil wood was known before the country had a (Western) name. There were great demonstrations and seminars – don’t miss the chair making one by Richard Vaughan titled ‘Seat yourself’. Richard Raffan and Bruce Bell did wood turning demos and Roger Givkin showed off his dovetail jig and demonstrated the art of small box making. I hope every educational institution teaching woodworking buys this as it will save countless hands from serious injury. There was a great selection of books at the Australian Woodworker stand – and you could pick up any back issues you missed on the news stands. If you are into bush crafts there was Stan Ceglinski with his crosscut saw race – but he is also very skilled with a riving knife too! If you are into boats – then the Cape Boatworks is a must visit – they are building a canoe from wood strips through the course of the weekend. It’s the first day and the canoe is already well advanced! After a total of about ten days work spread over about six weeks I now have a pochette! 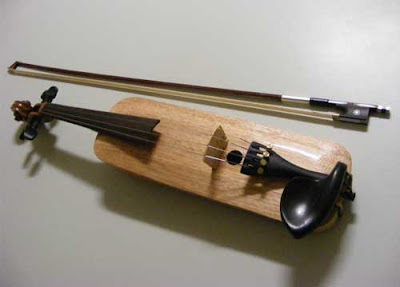 They said it takes ages to learn how to make a violin – they were right – I must’ve studied violin making for at least three hours, reading the whole book from cover to cover (ok looked at the pictures…). And quite suddenly the instrument was finished. As I tightened the strings I could hear that at least some of my wild guesses were right, and I was rewarded with a warm sound almost as loud as a normal violin. In fact it is as loud as my Maggini copy. That was my first surprise. The second was that with the first tuning up the wood moved to accommodate the strain and the strings quickly went out of tune. But after a couple of hours it stabilised and I was rewarded with quite a reasonable sound at good volume. Not too bad for a first attempt! And finally – what does it sound like? I’ll let you be the judge! Not my room (pity) but I thought this was a wonderful challenge to set a woodworker. It seems that a person in the US bought a whole room’s worth of Jacobean seventeenth century English oak wood paneling at auction and has commissioned a woodworker to get it ready for installation. Trouble is, it’s been stored for years in separate components and needs to be re-assembled and adapted to fit a completely different room – for the second time. William Randolph Hearst the eccentric publisher apparently bought the paneling from an old country estate in the UK and shipped it to the USA. When the Hearsts auctioned off a pile of stuff in 1998, the paneling was among the goods sold. Enter Woodwkr blog – the author of which has been given the challenge (!) of fitting this paneling in a new setting. His blog describes the process of sorting, digitising, designing and where necessary making new components to match, and getting the whole lot ready for installation. The latest post has a great story of how he came up with an idea to get the panels so sit flat for installation.